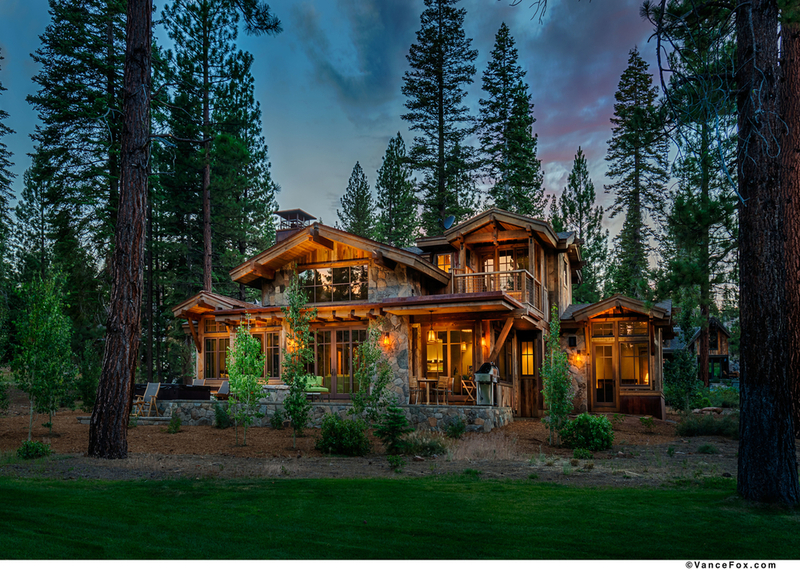 Located on the 13th hole of the putting course, this retreat is uniquely oriented to maximize views of Northstar's Lookout Mountain and the rolling hills, meandering creek and landscape of the putting course. The design of the home draws from its natural surroundings blending native stone, vintage reclaimed woods and rusted metals with contemporary elements. Like nature, the homes architecture has a simple - impactful elegance with purpose and intrigue. An inviting yard provides the warmth of the morning sun deep into the home. The patio includes a stone fire pit, hot tub and eating nook with a natural gas connection for BBQ. One master suite opens out to the spa patio with a separate seating patio outside the second master suite. The upstairs guest suite opens out to a private balcony with ample room for reclining and relaxation. 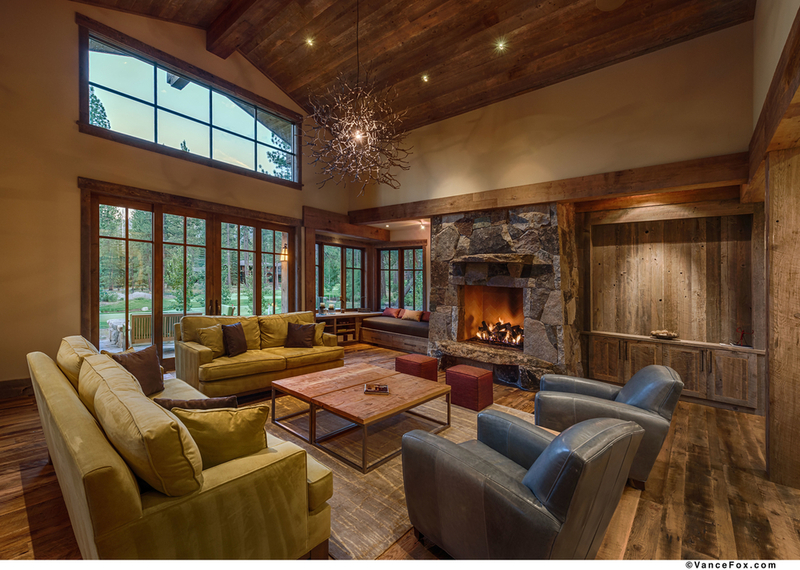 The home boosts one of the largest and most functional great rooms and family gathering spaces of any cabin home at Martis Camp. The design thoughtfully reduces wasteful circulation space and increases valuable family activity areas in the home. The homes core blends an open spacious kitchen, great room, media room and dining room. The open flow between the rooms accommodates large family gatherings but lend itself to intimate smaller gatherings. The kitchen opens to the great room by a 14' long kitchen island and 48" range with an integral prep table and eating table. The island design allows the eating table to be pulled away for seating of 14 or more people. The media room is within reach of the kitchen and can be quieted by the use of large sliding barn doors. The bedrooms are spacious, but not wasteful. The upstairs loft (4th bedroom) features built-in bunk beds for four and room for a queen size sofa sleeper. 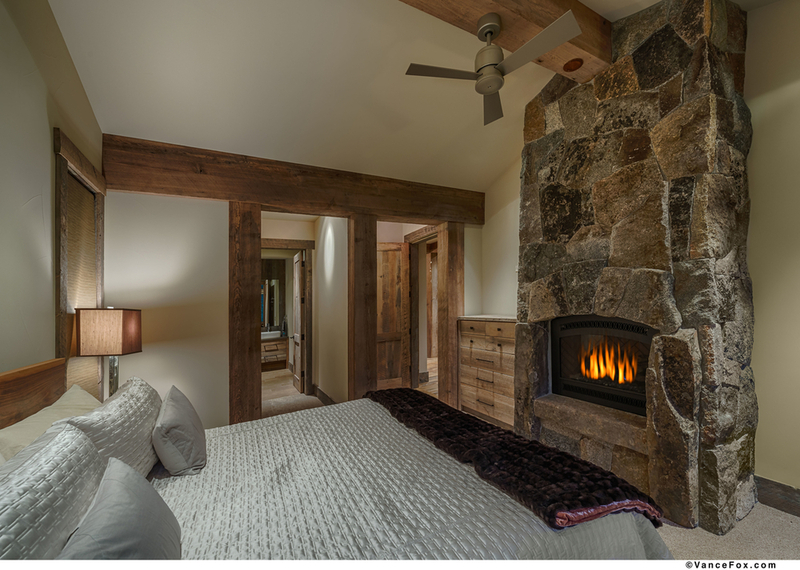 Master suites include the warmth and ambiance of stone fireplaces. The great room fireplace is a custom open flame Isokern fireplace with artistic stone hearth for authentic fireside moments. A built-in reading area that doubles as a twin size bed nestles itself against the fireplace taking advantage of the mountain and putting park views. The laundry room is well equipped and designed for the organization and storage of seasonal gear. The homes interior finishes, like its exterior, draws its inspiration from nature with colors and textures from its raw materials. 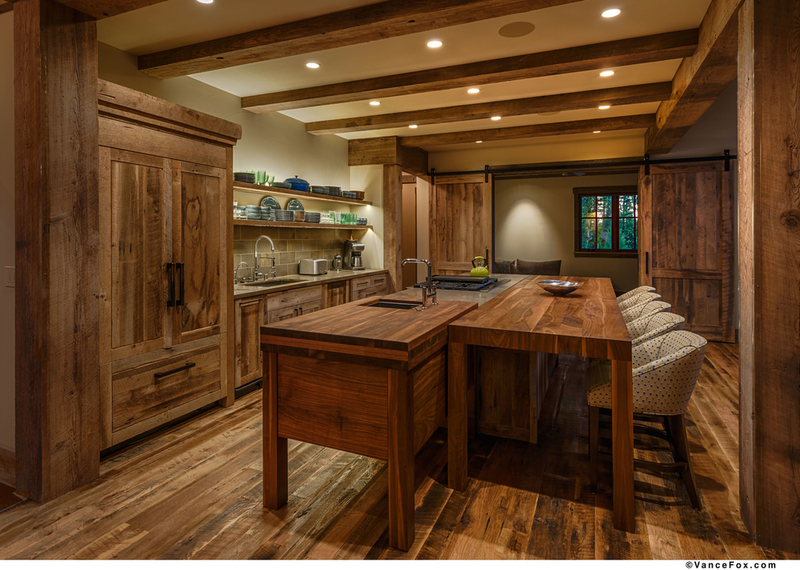 The interior design centers around essential built-in cabinetry, doors, casings, trims, floors, ceilings and beams in a combination of wire brushed reclaimed oak, barn wood and corral board. The homes essential rustic elements are offset with custom contemporary furniture pieces of natural walnut. Clean lines from contemporary plumbing fixtures compliment natural limestone counters. Art is introduced into the homes architecture through its custom contemporary light fixtures getting their inspiration from winters chill, a bucks grand antlers and the new growth of Springs branches. The great room's suspension light completes the essence of the home with an artful play on friends and family. Savant home automation system includes wireless lighting and heating controls, audio and video controls and security. Home automation system includes web interface for remote access from your mobile device. Exterior security camera for viewing weather conditions and driveway.